Figuring out how to ship out your pin sales can seem like one of the most daunting elements of starting your own pin-business. How do I figure out what to charge for shipping? How do I package my sales? How do I print out my labels? How does it all work? These all seem to be complicated questions at first, but fear not, shipping out your pin sales doesn’t have to be difficult, time-consuming or take up a lot of space. Use an e-commerce website that does the mailing price calculations for you. Good news! You don’t have to know anything about mailing prices in order to ship out your sales. Just pick an e-commerce website that does it for you! What’s the best option out there? From experience, I’d recommend you use Shopify. Not only do they offer a feature that automatically calculates the national and international mailing prices for your customers, but it is relatively easy to use and it offers the largest range of compatibility with third-party services, which you’ll need in the shipping process. In case you’re wondering, here’s a link to an article that will show you how to set up automated mailing prices for your store. Also, please use this link to get a 14 day free trial from Shopify. I'll get a commision if you sign up, which will help me be able to continue writing articles like this one. Use a shipping label manager service. Once you’ve automated mailing prices on your website, the next step is getting a shipping label manager that can make the process of importing, buying, and printing all of your labels as simple and as fast as possible. There are a lot of decent services there but, in my opinion, ShipStation is the best option because it’s easy to use, but most importantly, they offer the cheapest International shipping rates in the market (through them, you can offer international shipping as cheap as $5!) and they have awesome customer service (they called me a couple of days after I signed up, just in case I needed help). This will enable you to sell your pins internationally, which in the long run, will make a big difference to your bottom line. To get started, first set up your ShipStation account with their free trial, and link your Shopify store to your ShipStation. Once you’re set up, all of your sales will automatically show up on your ShipStation account, ready to be created and printed. In case this is your first time doing this, here’s a video that will show you the step by step process of everything you need to get set up with your Shipstation. Also, here's a great video from Heremeow, showing you exactly what you need to do set up cheap international shipping for your pin sales. 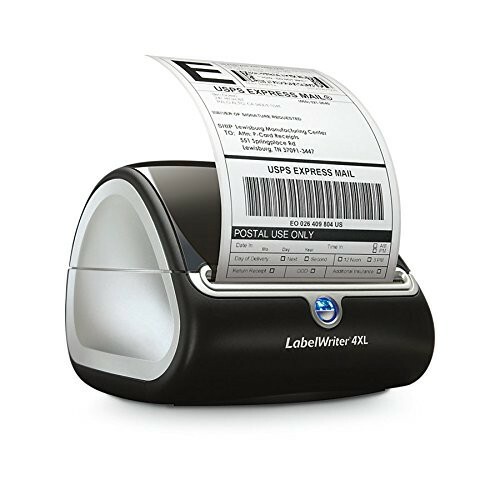 Buy a thermal label printer. Once you have your website and your label manager ready, you’ll need a printer to print everything out, straight from the comfort of your home. When I started @pinlord, I had no clue that there are printers out there that don’t require ink (crazy, I know!). Well, there is, and best of all, it’s the one you use to print your shipping labels. Introducing the DYMO LabelWriter 4XL Thermal Label Printer! Seriously, I never knew I could love a printer this much. Not only does it not require ink, but it’s a super-reliable workhorse (it hasn’t broken down for me once since I bought it a couple of years ago, and I use it at least twice a week), and it takes up next to no space. Believe me when I tell you, the $175+ price-tag will seem like a steal once you realize how much time, money, space, and energy it saves you. If you’re going to spend money on your at-home set-up, this is where you spend it! Don’t risk having a cheap printer that you can’t rely on and that will end up costing you a lot more in repairs. The DYMO 4XL is second to none (you can buy it here)! A pro tip: DYMO recommends that you buy their branded label rolls, but there are label options on Amazon that are exactly the same product as the “branded” ones, but at a fraction of the costs. I’d recommend you buy these. They are the ones I’ve used since I started and they haven’t given me any problems (but they have definitely saved me a lot of money). Use cost-effective and convenient mailing packages from Amazon. Okay, now that you can price, manage and print all of your labels, all you need is mailing packages to send out all of your sales in. The two most important aspects of your mailing packaging are: First, pin protection (if you don’t use bubble mailers your pin backs will be easily bent in the delivery process), and second, size (the smaller the package, the less it’ll cost you to ship). You can have fancy branded poly-mailers through a service like Stickermule (we can both get $10 off our next order if you use this link), but I’d recommend starting off with the most cost-effective and convenient option: Buying your packaging from Amazon. 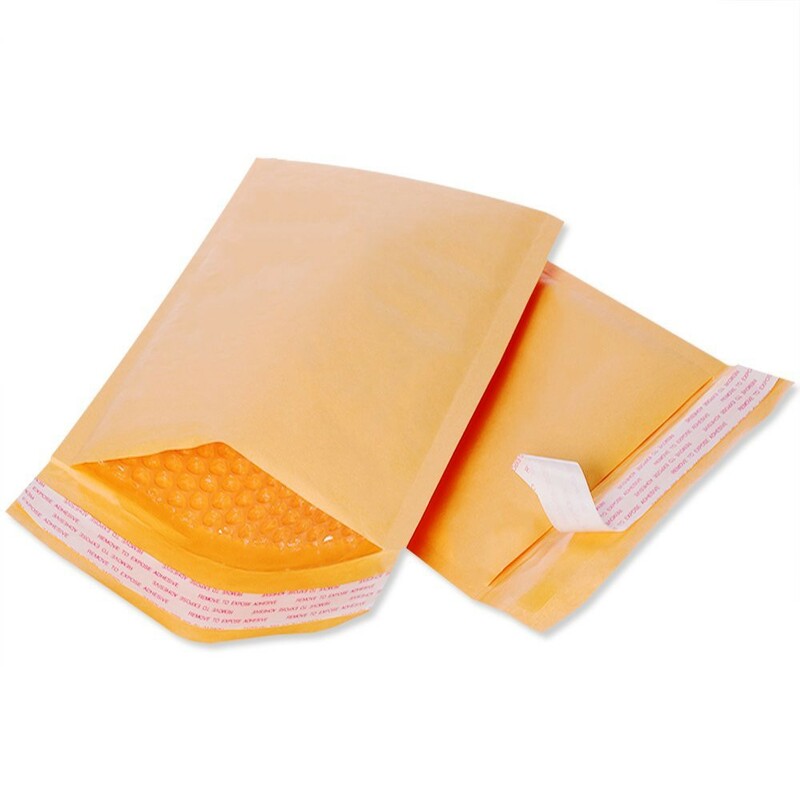 Global Kraft Bubble Mailers from Amazon. They look great at a fraction of the cost of the branded ones and I don’t have to keep a lot in stock since they are so easy to order from Amazon. Not having to spend a lot of money upfront for stuff like this is something super important for a pin seller who is just starting out. Every dollar counts and you should be spending it on your pin-making, not shipping mailers. Aaaannndddd, that’s it! 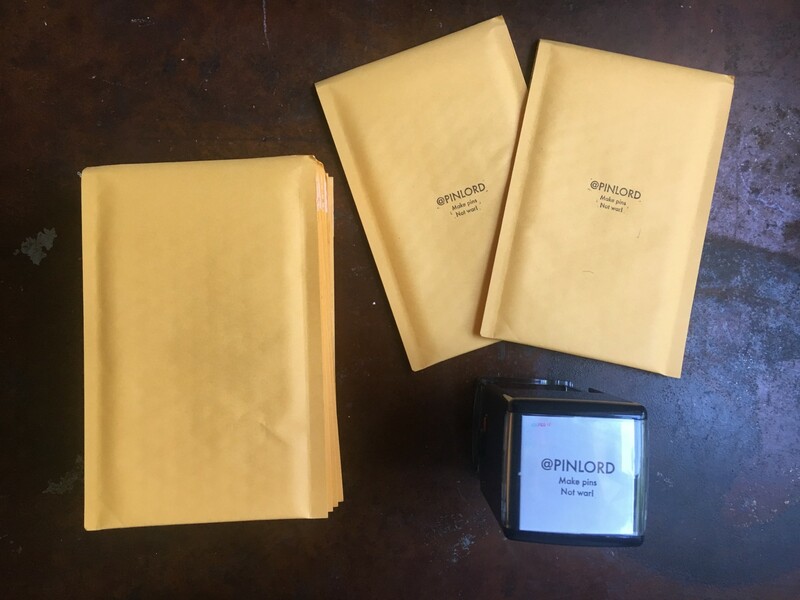 You are now ready to ship your pins out into the world! If you have any other questions or recommendations regarding enamel pin shipping, please get in touch by DMing me on Instagram at @pinlord. I'd love to hear from you!